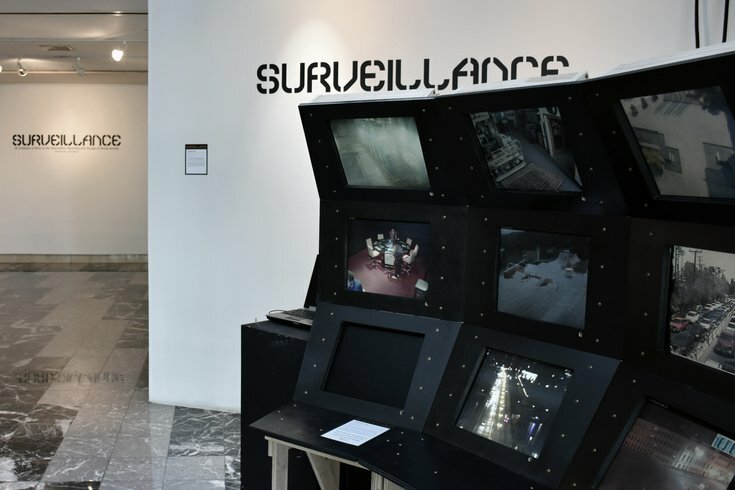 The Surveillance Desk, part of the 'Surveillance' exhibit on display at the Esther Klein Gallery, located at the University City Science Center at 36th and Market streets. On the phone with a friend? A stranger may be listening. Walking through your neighborhood? A stranger may be watching. Posting to friends on Facebook? A stranger may be reading. These are among the considerations artists Daniel Newman and Keith Hartwig want attendees to mull as they consume their new exhibit, "Surveillance," at the University City Science Center's Esther Klein Gallery, at 36th and Market streets. Hartwig, an adjunct professor of architecture and visual studies at Temple University's Tyler School of Art, and Newman, a local architect, began collaborating on the exhibit shortly after connecting at the Japan Media Arts Festival last year. Together, they set out to explore how surveillance has permeated our lives, not just in the past few years, but during the past few decades. And it's a pretty alarming collection of art. 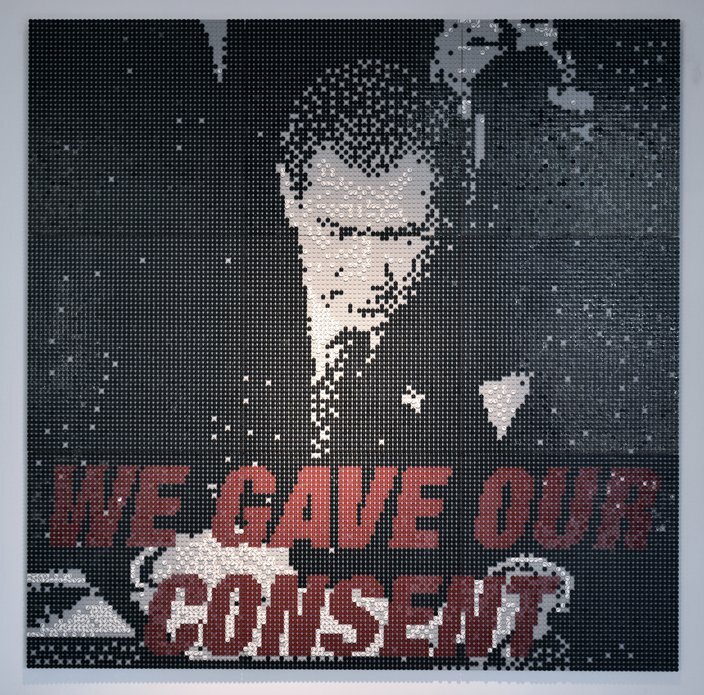 First sight upon entering the gallery: a LEGO recreation of President George W. Bush signing the Patriot Act on Oct. 26, 2001 – one part of a short series of statement pieces. Circle around LEGO Bush and you'll find three more surveillance-significant moments portrayed in LEGO form, all of which show turning points in the evolution of modern surveillance culture: In 1988, when presidential candidate Gary Hart was hounded about an alleged affair (he was followed by a private investigator); that same year when convicted felon Willie Horton was portrayed menacingly in a George H.W. Bush campaign ad, ushering in a fear-based era of "Cops" and "America's Most Wanted"; and a Facebook photo of Mark Zuckerberg with his newborn child, meant to symbolize how surveillance has become commodified. A LEGO recreation of President George W. Bush signing the 2001 Patriot Act. Newman noted that most surveillance today is voluntary – a sacrifice many make for the sake of convenience. "On the web we allow ourselves to be surveilled. We know when we’re on the phone, on our desktop machine and when in public we’re going to be watched by something, whether because of the convenience of an E-ZPass or a credit card shopping online – we’re giving something up for the information we generate," Newman said, "because what we do makes someone else money." Another installation in the exhibit takes a more literal approach to demonstrating surveillance using monitors that show footage from more than 1,000 real-time, public cameras around the world – ones not password-protected. ("No baby monitors" are tapped into, though, Newman quipped.) The idea, of course, is that anyone could be watching, from anywhere – even the Science Center in Philadelphia. The exhibit pays special attention to how information technology has changed surveillance. On a back wall, for example, a mural showcases the city from the perspective of a drone. It's made using recreated PlayStation controller buttons. 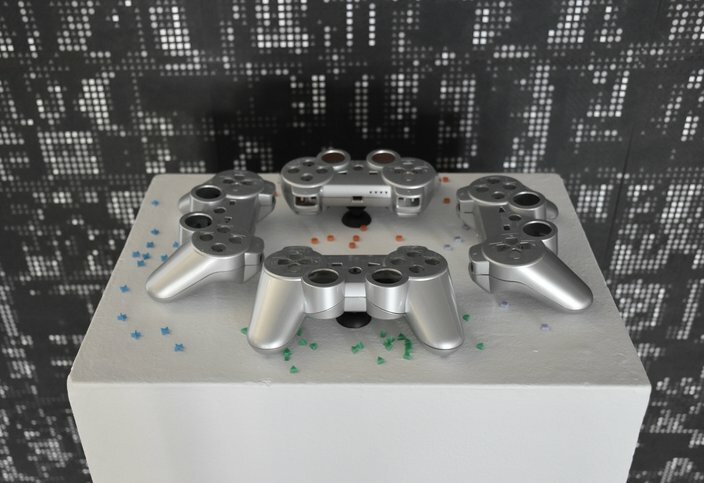 PlayStation controllers recreated as an accessory to a drone-themed mural. Many controllers for drones use a similar design as Sony's classic video game controller. "If you go to Best Buy or any consumer electronics store, you’ll see consumer drones for sale. And a lot of controllers are modeled after old video game controllers, like PlayStations," Hartwig told PhillyVoice. "They’re really marketed as being safe, fun, pleasurable objects or technologies. On one hand, there's this image of drones being these fun and harmless objects, and on the other, this notion that technology has allowed for a sort of ubiquitous surveillance and constant observation of people. And these two techs are emerging simultaneously." A mural of Philadelphia, from the view of a drone. The mural is tacked with sized-to-scale PlayStation buttons – circles, triangles, squares and 'X' symbols. Rounding out the exhibit is a wall of "drone action figures" (which attendees are encouraged to create and bring in on their own) that happens to feature the Philadelphia Police Department Ford Explorer marked with a Google Maps decal, as well as a video installation playing an audio loop of shots fired – in the actual order and location they were surveilled through a ShotSpotter surveillance system set up in Washington, D.C. (Also set up in Camden, by the way.) 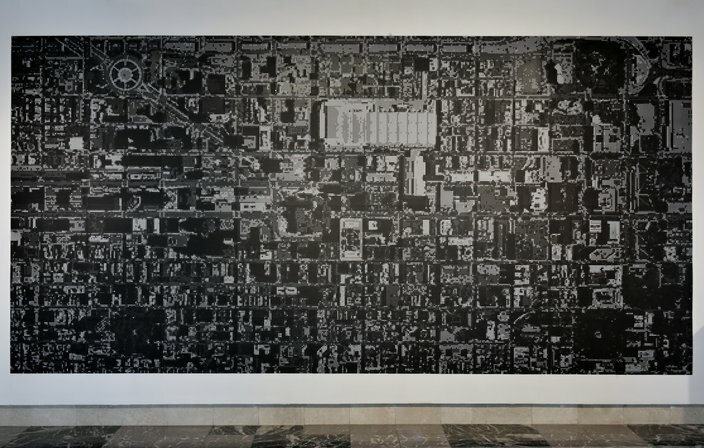 The artists received the data in the form of an Excel spreadsheet after putting in a Freedom of Information Act request, then used GIS software to map the gunshots, created a timeline and rendered them. In the end, the point of the exhibit is to remind people that modern surveillance is not as simple as being followed by a private eye, or as obviously unsettling as being monitored by a security camera. As Hartwig noted, it's often wrapped in a "fun" image – like Mattel's "Hello Barbie," which can record conversations kids have with their doll. On Sept. 10 at Dilworth Plaza, Hartwig and Newman will host a scavenger hunt, in which participants will take photos of objects in Center City they discover are used for surveillance. Those geotagged photos will then be implemented into the surveillance mural in the exhibit. "Surveillance" is on display through Sept. 30.